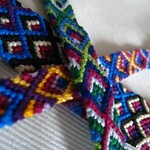 This 5 Color Chevron Bracelet is a great craft to start at a short meeting and let the girls take home to finish later. 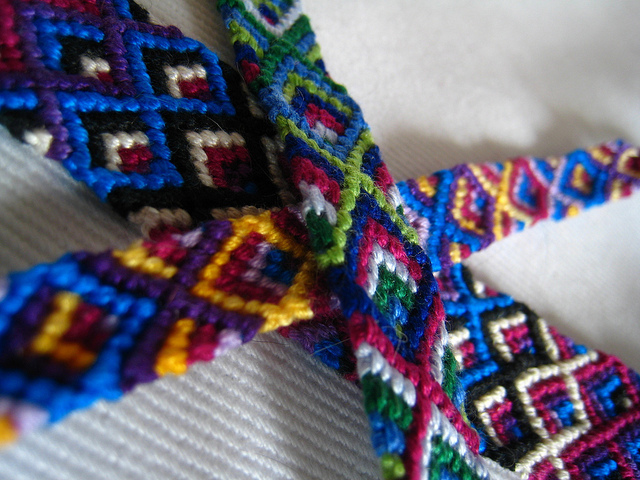 Please refer to the Friendship Bracelet Knots page for instructions on how to make the knots mentioned below. Cut two 65″ lengths of each color for 10 strands total. Even out all the strands and together, fold all in half to form a loop at the top and knot. Pin together or tape the loop to your work surface. Arrange the strands in mirror order for these colors: A,B,C,D,E – E,D,C,B,A. Start on the right with strand A. Working towards the center, make four right-hand knots: A onto B, A onto C, etc. Stop at the center. With strand A from the left side, make 5 left-hand knots. A onto B, A onto C, etc. The fifth knot should join the 2 middle strands together. Your color order should now be B,C,D,E,A – A,E,D,C,B. Repeat steps 4 and 5 until the bracelet is the desired length. Once the bracelet is long enough, tie a knot at the end, leaving a 4″ tail and trim. Wrap the bracelet around your wrist and tie the tail end to the looped end. Only older girls should use the safety pins to secure the starting end of the bracelet.